Welcome to Old Brewery Antiques. You are now under the antique lamps page. Lamps are used mainly as a source of light. Yes that’s a fact but aside from that, lamps also serve their purpose even if not lightened; how? The answer- as beautiful decors around the house. 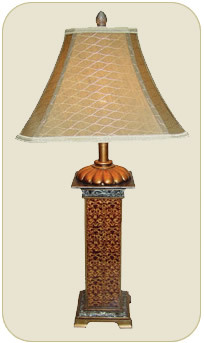 Antique lamps, or simply lamps, are one of the most traditional items to find in our homes. Although most of them are located in our bedrooms, others also placed them as a décor on the side table in the living room, or maybe a nice centerpiece in the dining table. It can also be fixed or hanged on the sides of the wall to light the stairs, and can also be placed outdoors, for many other decorative purposes you might think of. Antique lamps come in different designs, styles, materials, and colors, although the majority of these antiques are mostly available in earthly or monochromatic colors; and its materials are typically made from glass, brass, wood, cast iron, bronze, and other mixed materials. Old Brewery Antiques only gives you the finest antiques in town. These antique lamps were collected from as early as the post-1800 era up to the mid-century of this present time, while the rest of the others remain its age to be undiscovered. These antique lamps are surely a wonderful décor to accentuate the beauty of your homes, and will surely bring more elegance and exquisiteness on your households. So take your chance now and look around, and see the best lamp that’s well suited for your home. Copyright © 2011 Old Brewery Antiques. All Rights Reserved.